A mind-crippling prediction from a borrowed cell phone! Search "iPredict Pro" on YouTube. From the creators of iForce and iPredict+ comes the World's FIRST professional magic app. You want to leave your number with someone. For example, her name is Linda . . . she's a blonde, wearing a red sweater. "I'm going to be leaving for a vacation tomorrow. I've already recorded my 'going away' message on my voicemail." "Before I ask you anything, please punch in my mobile number on your phone." "Here's a list of the cities I was considering for my vacation on this napkin. Why don't you point at your favorite city." Let's say she points at London. "WOW, you went straight for it! Hit 'Send' on your phone and call me." You give your phone to her, she calls your number, and rejects the call on your phone so it goes to voicemail. "Hi, If you're trying to reach me this week, I'll be on vacation. I'm going to be in London, England. So, if you're the blonde with the red sweater, AND if you like my city, perhaps you should join me. Leave a message after the beep." This is one of an infinite number of applications of iPredict Pro. You can also have your spectators call/text a third party (psychic, friend, etc). If they text this third party, he/she will reply with the correct prediction in a text message (this is great for loud environments where a phone call is hard to hear). The phone call or text message looks completely real - because it IS completely real! On their OWN phone. Standard phone and text message rates may apply. ◆ Easy to do. Includes written/video instructions and a Training Mode. ◆ Includes two preset effects (cards & numbers) so you can start performing immediately. ◆ Customize iPredict Pro to use your voice/text messages . . . the possibilities are ENDLESS! ◆ Your spectators can call or text from THEIR phone! ◆ You can perform anytime (no need for any props). If you have your phone, you can perform. 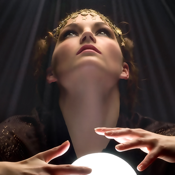 ◆ iPredict Pro uses ONE number. You can hand out this number before you begin. ◆ You can choose (on the fly) if that number is YOUR mobile number or another number. ◆ If you perform with YOUR number, when your specs call you, THEY will reject the call to voicemail. ◆ Since iPredict Pro uses a voicemail server, you can have ALL of your spectators call you at the SAME TIME! ◆ Camouflage iPredict Pro to make your phone completely examinable. iPredict Pro is NOT a TOY. It was designed for the professional magician that demands pro quality, AMAZING effect and customizability in a powerful utility that works ANYTIME, ANYWHERE, without ANY props. Are you ready for the ULTIMATE phone effect? Download iPredict Pro now. This app is intended for entertainment purposes only and does not provide true mind reading functionality.